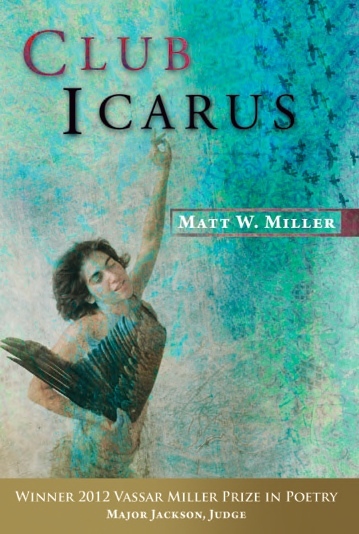 Matt W. Miller’s second book of poems, Club Icarus, is the winner of the 2012 Vassar Miller Prize in Poetry. 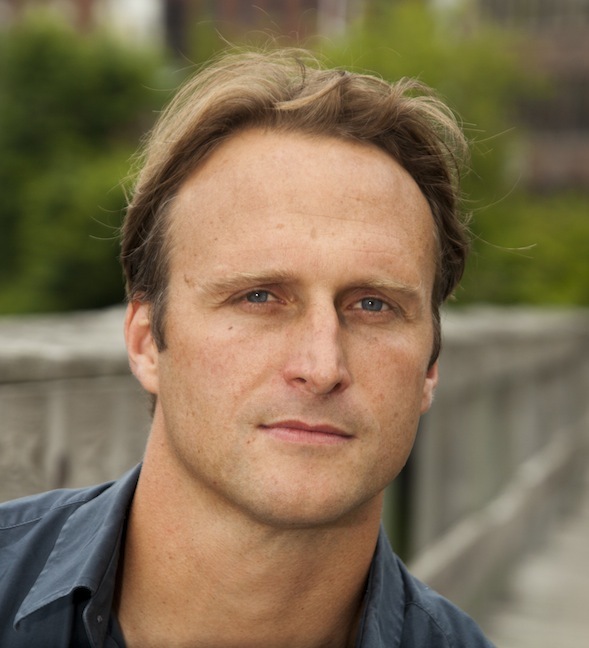 His poems “Ballistics” and “Deciduous,” which first appeared in Memorious issue 11, capture well the style and tone of the poems in Club Icarus: these are gritty, at times violent poems that touch on fatherhood, sonhood, football, personal and national wars. Several themes run through the collection like a braid. We meet a father facing the loss of his baby daughter, a father who watches his laughing daughter fall with him out of an airplane, a father who recognizes the signs of “running away” and follows his daughter to a graveyard. Another string of poems describes the strangeness of experiencing, as an adult, a parent’s illness and death. The poems are often both aggressive and tender as their speaker describes the anxiety of birth and a 720 degree snowboard jump, looks through the eyes of military survivors, addresses the gunman of the Aurora, CO shooting, and follows a boy with comic book superhero ambitions. Miller is an English teacher and football coach in Exeter, New Hampshire and he has kindly answered a few questions for us. Some of the poems in Club Icarus touch on recent news items. How much impact do you feel current events have on your writing? I suppose they do in that there is not that much new about the news. We can change the names and places but essentially the human experience has not changed that much since we developed the capacity for symbolic thought some 40,000 years ago. We are born and die and in between those points, inside that “cradle that rocks above an abyss” there is this wonderful and harrowing experience of living. We experience the same love, anger, loss and redemption now as we did thousands of years ago. So what’s now is what is then. There can be both comfort in that, this common experience of life, but also frustration too, I suppose, in that we keep repeating the same mistakes and miscalculations. But in those miscalculations, in seeing how close to the sun is too close, perhaps we do push something forward, if only a little bit. There’s that greatness in us: tell us something can’t be done if only to give us a reason to try and do it. What prompted you to choose Club Icarus as the title for the collection? Many of the poems revolve around this idea of the extreme that we experience in just living. There’s the traditional Icarian archetype of youth, boys hanging behind trucks during blizzards for kicks or pro skater Jake Long pushing the heights of vertical skateboarding, where we ignore practical advice because we need the experience of extremes to know where moderation lies (that Blakean “road of excess leads to the palace of wisdom” idea). But this applies also to the great extremes we all experience in life, the great joy (falling in love or having children) as well as the great suffering that life can be (disease, losing a father, or the reality that you may lose a child). The human body seems to play a central role in the poems of Club Icarus. Not to be flip, but I think the human body is central to all art and really everything we do. The only way we experience the world is through the body, processing mentally what we experience through the physical senses. The catalyst to create in many ways comes by seeing, smelling, tasting touching, hearing the world and knowing it all will end all to soon. “Death is the mother of beauty” says Stevens in “Sunday Morning,” and I tend to agree. Life grinds against the body and out of that friction we make and create, whether it is a painting or a song or a poem, a good IPA, a walk off double in the bottom of the ninth, or making the effort to make blueberry pancakes for your kid’s Monday morning breakfast instead of the usual corn flakes. Would you mind telling us more about “Ballistics” and its background? I was living in East Palo Alto while I was on a Stegner Fellowship at Stanford. One Sunday afternoon in January, a month of surging gang violence in EPA, while my wife and infant daughter were playing in the front yard, two kids were gunned down in a drive by shooting just up the block. The car flew by our house as my wife ran in the house with our daughter. It was pretty terrifying and I tried to down play it but it really got to me. I’d seen violence play out plenty before. But how could I live in this neighborhood and risk the life of my family? How could I move with no money? I had grown up in Lowell, MA which is pretty tough and lived in New Haven and Oakland but it was different now as a father and husband. I was risking much more than me. And I felt helpless about it all. As I was trying to process the experience I started reading FBI reports on ballistics and what bullets do to the human body. Out of some of the language in those reports I drew out phrases and words that led to this poem, which helped me deal with the experience. Writing isn’t therapy but it can be therapeutic or least help you not bury something so it eats you up over time. So there is the refusal of death in this poem, or at least the attempt to refute death, by creating something out of destruction. For original poetry, fiction, interviews, art, and art song, please visit our magazine at www.memorious.org.